Primary skin irritation is the result of chemical substances coming in contact with the skin. 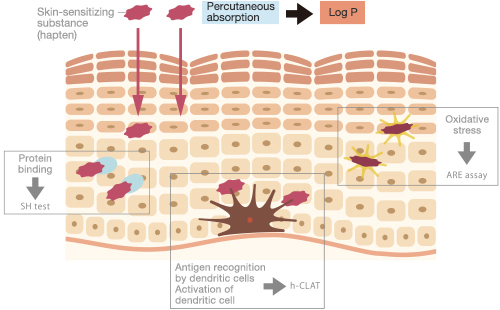 This inflammatory response is a local response that involves no systemic immunological response and is different from skin sensitization. Cosmetics are applied directly on the skin and thus must undergo verification to make sure they do not cause skin irritation. Test methods to evaluate cosmetic ingredients include the collagen gel test , which uses a three-dimensional cultured human skin model comprising human fibroblasts and collagen. After demonstrating no problems with respect to skin irritation in this test, an ingredient undergoes a final evaluation by patch tests in human subjects. Eye irritation may occur when a chemical substance enters the eye. Some cosmetic products such as eyeliner, eye shadow and mascara are applied around the eye and can easily enter your eyes. Products such as shampoo can also accidentally get into your eyes. Such products undergo evaluations to make sure that they cause no inflammatory responses should they come in contact with the eyes or only transient, reversible and non-serious symptoms after rinsing with water or other first aid measures. Eye irritation tests for cosmetic ingredients include the SIRC-CVS test , which uses a single-layer cell culture model with SIRC cells for water-soluble substances; and the collagen gel test , which uses a three-dimensional cultured human skin model comprising human fibroblasts and collagen for poorly soluble substances. Phototoxicity may occur when chemical substances come into contact with the skin under sunlight (particularly ultraviolet rays). There are substances that only induce skin irritation responses after exposure to light. To make sure that cosmetics are safe to use even for those engaged in outdoor activities under strong light, ingredients must be evaluated to make sure that they exhibit no phototoxic potential. Phototoxicity tests for evaluating cosmetic ingredients include the 3T3 NRU photo toxicity test , which uses a single-layer cell culture model for water-soluble substances, and the photo-collagen gel test , which uses a three-dimensional cultured human skin model for poorly soluble substances. Skin sensitization is a delayed type allergy as a result of chemical substances coming into contact with the skin. Cosmetics are used on a daily basis. Thus, it is very important to make sure that they have no skin sensitization potential—the potential to cause skin allergic responses. Skin sensitization tests for cosmetic ingredients are conducted in vitro and in silico. In vitro tests include the SH test with protein binding as an indicator, the ARE assay with oxidative stress as an indicator, and the h-CLAT test with dendritic cell activation as an indicator. Based on the results of these in vitro tests, the degree of skin sensitization potential is calculated with a computer-learning model called “artificial neural network model”. Meanwhile, physico-chemical properties obtained from the structure of the substance being evaluated are analyzed in silico using a computer-learning model to predict the degree of skin sensitization potential. The skin sensitization potential is determined comprehensively based on the results of these evaluations with weight of evidence. Photosensitization is a delayed type allergy, which occurs when chemical substances come in contact with the skin under sunlight (particularly ultraviolet rays). There are substances that only induce skin allergic responses after exposure to light. To make sure that cosmetics are safe to use even for those engaged in outdoor activities under strong light, it is very important to evaluate ingredients for photosensitization potential in addition to sensitization potential. Photosensitization tests for cosmetic ingredients are conducted in vitro and in silico. In vitro tests include the ROS assay, which evaluates generation of active oxygen species, the photo-SH/NH test with protein binding under the presence of light , and the photo ARE assay with oxidative stress under light exposure. Based on the results of these in vitro tests, the degree of photosensitization potential is calculated with a computer-learning model called “artificial neural network model”. Meanwhile, descriptors obtained from the structure of the evaluated substance are analyzed as an indicator in silico using a computer-learning model to predict the photosensitization potential. The photosensitization potential is determined comprehensively based on the results of these evaluations and weight of evidence. Single dose toxicity is caused by a single dose of a chemical substance or repeated doses over a short period of time. The degree of toxicity can be classified by determining the cytotoxic dose. The SIRC-CVS test , using a single-layer cell culture model, can be applied to single dose toxicity estimation. Genotoxicity is a property that makes chemical substances toxic to chromosomes, genes, DNA and other material with genetic functions. It is also used to predict carcinogenicity. In vitro genotoxicity tests for cosmetic ingredients include the bacterial Ames test (reverse mutation test), the chromosomal aberration test with CHL cells and in vitro micronucleus test with cell culture. Repeated dose toxicity is systemic toxicity resulting from daily repeated doses of a chemical substance over a certain period of time. Repeated dose toxicity studies are used to ascertain the type and degree of toxicity and to estimate the highest dose that induces no toxicity-related changes (no observed adverse effect level). Furthermore, a comparison between the no observed adverse effect level and systemic exposure to the chemical substance allows the assessment of its systemic risk. Cosmetics are products for long-term use. Thus, they must demonstrate no long-term systemic toxicity. There is no validated in vitro method for repeated dose toxicity. The repeated dose toxicity of cosmetic ingredients can be estimated using the QSAR (quantitative structure-activity relationship) model and the Expert system (read across) . This toxicity of chemical substances affects the reproductive functions of both sexes and induces impaired fecundity, offspring deaths, delayed development and morphological and functional changes. The highest dose at which no toxicity-related changes occur (no observed adverse effect level) is estimated based on the degree of toxicity. Furthermore, a comparison between the no observed adverse effect level and the systemic exposure to the chemical substance allows the assessment of its reproduction/developmental toxicity risk. Cosmetics are products for long-term use. Thus, they must demonstrate no reproduction/developmental toxicity. As with the repeated dose toxicity, the reproduction/developmental toxicity of cosmetic ingredients can be estimated using the QSAR (quantitative structure-activity relationship) model and the Expert system (read across) .